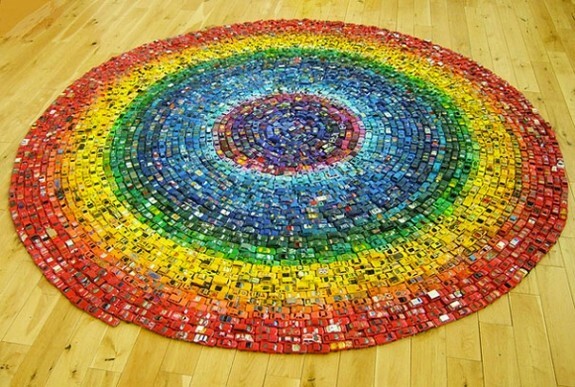 2,500 Matchbox cars on a room floor sounds like it would be some child’s nightmare cleanup job. But in the hands of David T Waller it’s art. The UK-based artist arranged the toy cars in a giant circular rainbow pattern create Car Atlas. It was displayed at Artsdepot’s Apthorp Gallery where visitors voted it their favorite art piece. Barbie heads, toy hairbrushes, alphabet magnets, superhero action figures, doll house furniture sets, play soldiers and a huge assortment of other plastic toys of the sort that probably collected under your bed and on your closet floor when you were a kid — such items are full of artistic possibility to British designer Robert Bradford. 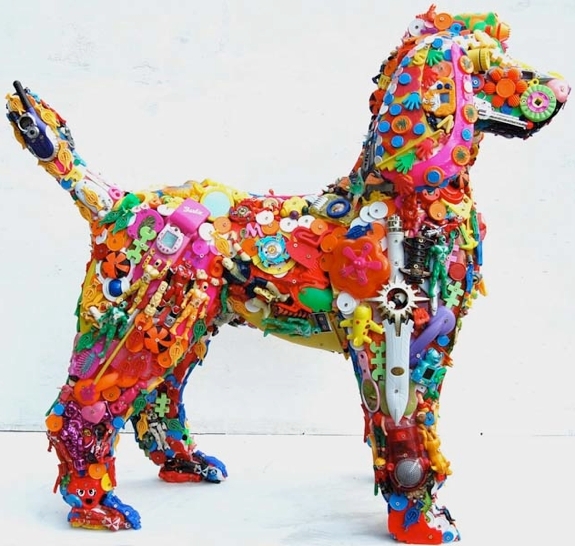 He spares well used plastic toys from a slow decay in a landfill, using them to make sculptures instead. Most of Bradford’s sculptures are life-size or larger-than-life. He’s sculpted people, objects and a variety of animals, but his favorite subjects are dogs, every one of which uses old toy flashlights for eyes. When are animal skin rugs cute? 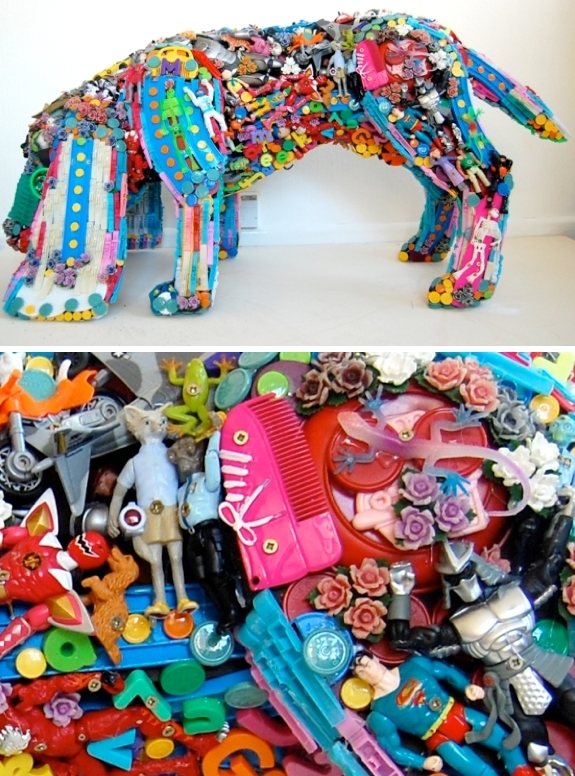 When the animals they are made from were once children’s toys. 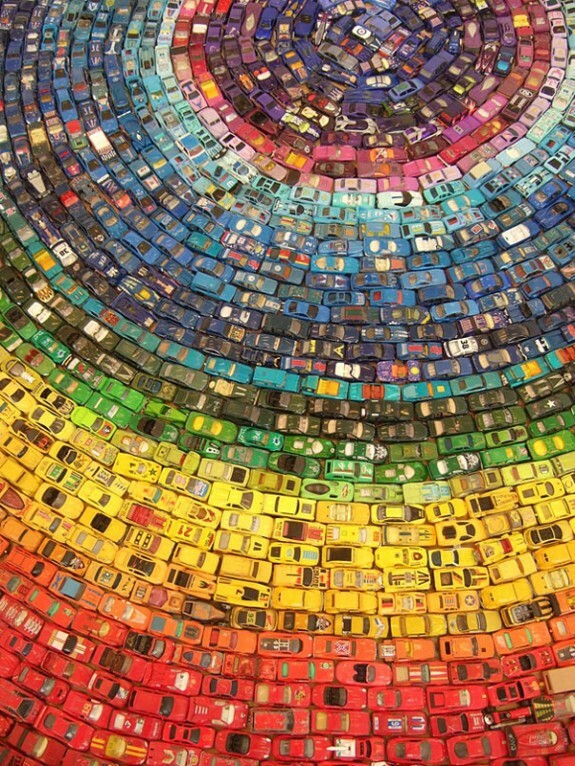 That’s what Miami-based but Argentine-born artist Agustina Woodgate uses to make her rugs. 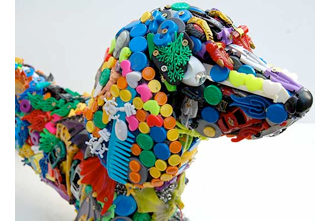 Donated stuffed animals are de-stuffed, cut open for their “skins” and then arranged in semi-symmetrical patterns. 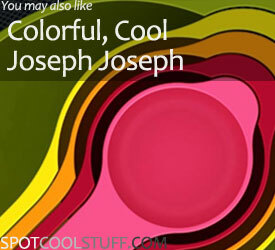 The end result is quite as huggable as the source material, but it is soft and cool-looking. 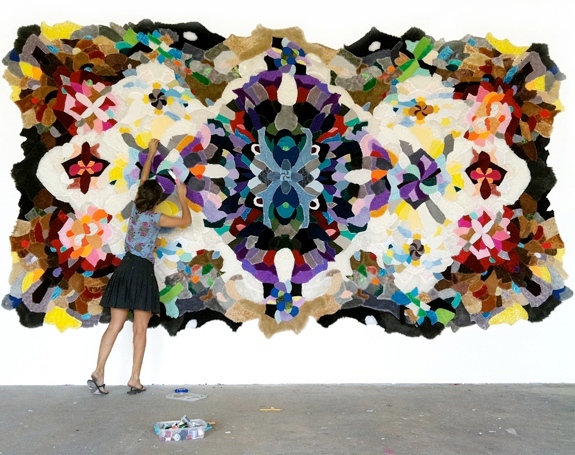 The stuffed animal skin rug shown in the photo below is Woodgate’s largest. See her website for photos of others. 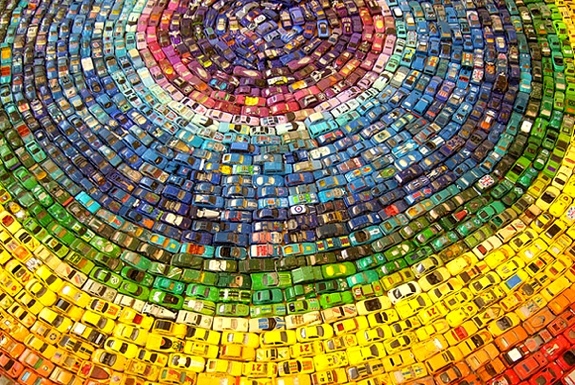 Art made from used toys needn’t be visual. So have proven the conceptual electronic music group Beatrix*JAR. 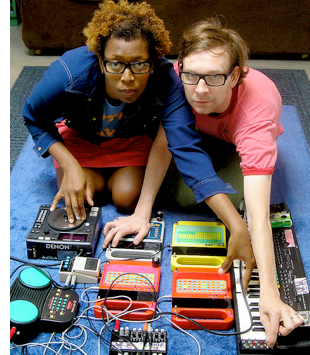 Founders Bianca Pettis (aka Beatrix) and Jacob Aaron Roske (JAR) create their unusual collage of glitchy and garbled sounds through circuit bending. The process involves taking low voltage electronic gadgets and altering their circuit boards to change the sound they produce. Old electronic toys are tops among the items Beatrix*JAR incorporate into their mad-capped melocies. On their track Paint by Numbers, for instance, you’ll hear a circuit bended kid’s drum machine, a toy robot and a Speak & Spell. The resulting tune isn’t quite Spot Cool Stuff’s cup of musical tea, but the circuit bended process through which it is produced is C-O-O-L.